One of six Oldenburg and van Bruggen sculptures in California. Born January 28th, 1929 in Sweeden, Claes Oldenburg is an American trained sculptor. He is known for giant sized replicas of common everyday objects. His sculptures were often created with his wife, Coosje van Bruggen. Sadly, after 32 years of marriage, she passed away in 2009. Their sculptures are found all over the world. The first art piece of Claes Oldenburg and Coosje van Bruggen that I ran across was in Kansas City where four giant shuttlecocks were installed around the Nelson Atkins Museum of Art. Being a fan of larger than life items like giant shuttlecocks, I looked to see if they had any sculptures in California. As it turns out there are six of their sculptures in our great state. There is also a Giant Flashlight of theirs on UNLV campus in Las Vegas. The first art installation in California was put in place in 1982 in Sherwood Park of Salinas California. There Oldenburg and van Bruggen have the art piece: Hat in Three Stages of Landing. The art installation consisted of three giant cowboy style hats in the park, each supported by two poles of different heights. Each hat is about eighty feet from the next one, and the hats are approximately 9 1/2 feet by 18 feet by 15 1/2 feet. They also weigh about 2,310 pounds! The art sculpture is suppose to reflect a cowboy throwing a cowboy hat from the nearby rodeo as it falls to the ground. The brim of the hats is folded down in a way that a cowboy normally wouldn't do, but this is to evoke imagery of a horse's saddle. Holes appear in the hats in order to look more like a salad colander, since 80% of the world's lettuce comes from Salinas thus giving it the moniker the "Salad Bowl of the World". This was the first art project that Claes Oldenburg worked together with his wife Coosje van Bruggen. But by April 2013, the hats had accumulated graffiti, homeless were sleeping under the art installation, and the paint was peeling badly. They were taken down for restoration in April of 2013 but came back on November 19th, 2013. In addition to $190,000 in costs ($45,000 of which was donated by Oldenburg himself), the restoration required a special blend of yellow for the new paint. Oldenburg had luckily kept a sample of the special blend, undisclosed all these years. Installed in 1986, this art piece resides at Loyola Law School in Los Angeles. Frank Gehry was working on Loyola Law School when Oldenburg and van Bruggen added this Toppling Ladder to the campus. Gehry had placed four concrete columns on campus and was considering adding a fifth collapsed column. Instead Oldenburg and van Bruggen added this sculpture where the fifth column was to go. The ladder and paint bucket are gray so as to match the color of the columns, and the paint spilling off the top is blue. It is over 14 feet tall. Located in Los Angeles, formerly at the Margo Leavin Gallery, this art piece was installed in 1989. It's exactly what it sounds like, a gigantic knife slicing through the outside wall of the building. The Margo Leavin Gallery closed in September 2012 although the knife is still present on the building. In 1986, near Los Angeles, in Venice, Frank Gehry was working on the Chiat / Day building complex on Main Street and wanted to add one more building to tie the entire complex together. He took a model of Oldenburg and van Bruggen's that had been for an art commission in Venice, Italy but had never seen fruition and stuck it in the scale model of his building complex. The model was for a giant pair of binoculars. And the idea took. From 1989 to 1991, Claes Oldenburg and Coosje van Bruggen built the giant binocular building that stands on Main Street in Venice. Originally meant for Venice, Italy, it is somewhat fitting that the sculpture found a place in Venice, California. The binoculars are forty five feet tall and function as both pedestrian and car entrances, as the entrance to the parking garage is between the lenses. Google now resides in the complex. The building brings back memories of Los Angeles Programmatic Architecture from decades ago. "Corridor Pin, Blue" or the Giant Safety Pin as most people refer to it, was put up in 1999 in the Sculpture Garden of San Francisco's De Young Museum. This massive 21 foot tall safety pin stands over the walkway, and can be seen over the hedges that surround the sculpture garden. The De Young Museum can be found in Golden Gate Park and the sculpture garden is free to wander around in. Note, dogs are not allowed in the sculpture garden. The New Orleans Museum of Art has an exact twin of the sculpture in their Sydney and Walda Besthoff Sculpture Gardens. I have also heard rumors of another copy in Dallas, and have seen a picture of one in Loire Valley, France, where Oldenburg and van Bruggen owned a chateau. As a result I'm not sure how many copies of the giant safety pin actually exist, but it sounds like there are at least two. For more unusual sites, Golden Gate Park in San Francisco has also been home since the 1890s to the Buffalo Paddock where American bison roam and to Stow Lake which is haunted by the ghost of the White Lady. 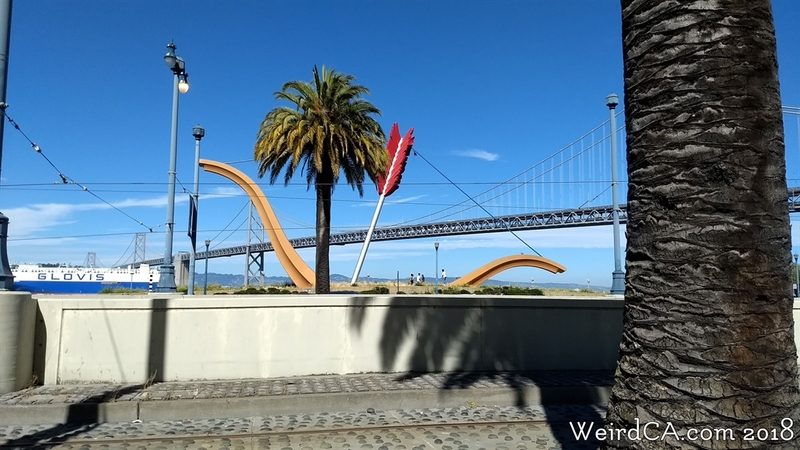 In November of 2002, Cupid's Span was placed in Rincon Park in San Francisco near the Bay Bridge. Cupid's Span is a giant bow and arrow with the arrow pointed down into the ground. By using this angle, the shape of the bow also gives off the impression of a ship's curves, giving the appearance of a boat heading towards the Ferry Building, and the bow string looks like a tightened version of the nearby suspension bridge, the Bay Bridge. The entire piece is also meant to frame both the Bay Bridge and the downtown area depending where one stands.